“Missing links”, non-operational small-scale cross-border railway connections, within the European Union have gained political momentum in the past years. More crossborder railway passenger transport across additional cross-border connections could enhance mobility and economic development in the border regions. As a first step, the present study provides an inventory of all cross-border rail connections along the EU and EFTA internal land borders, containing maps and data inter alia on the operational status, technical aspects and stakeholders of each connection. In a second step, the viability, network relevance and investment need and funding opportunities of possible new railway connections are analysed. 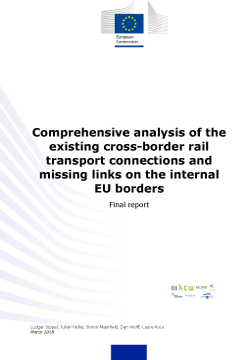 Finally, the study proposes recommendations how to smoothen the implementation of crossborder railway connections. Most of the small-scale cross-border railway connections do not belong to the TEN-T Core or Comprehensive Network and have previously mostly been disregarded from funding for investments. Gaps in the cross-border passenger rail network are not necessarily caused by missing elements of infrastructure: In many cases even on operational railway infrastructure there is a lack of cross-border passenger services. Competent authorities of the Member states can play a crucial role for implementing cross-border passenger services on these lines.